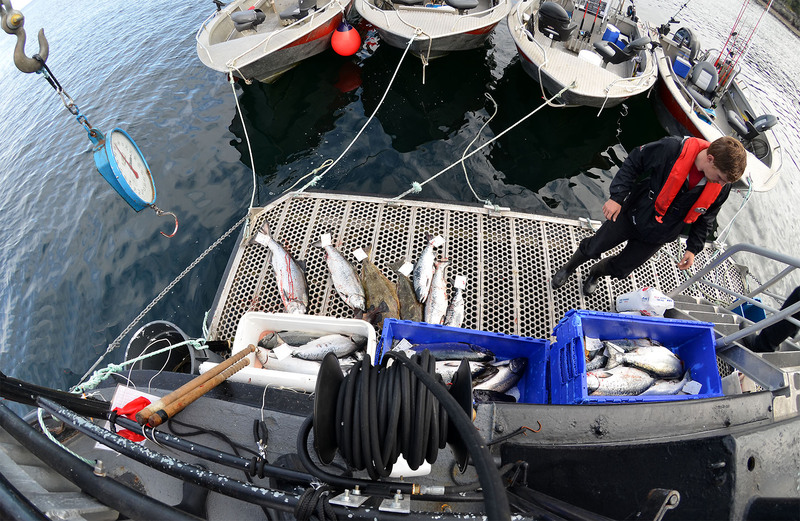 We just returned from our annual Canadian salmon fishing trip for 2015. This year we were at the Queen Charlotte Lodge for the second year in a row. We had good travel connections both ways. You fly to Vancouver, catch an early chartered jet the next morning to Masset on Haida Gwaii (formerly Queen Charlotte Island), and then take a 12 minute helicopter ride to the Lodge, (the reverse on the way home). We opted for the four day fishing package to maximize our chances. You arrive at the Lodge before 10:00 am on the first day, enjoy a quick brunch and orientation, and then you start fishing. This year we paid for a half-guided trip (last year we went off on our own). Both times we’ve stayed on the MV Driftwood, a nicely refitted tugboat operated by the Lodge that sleeps 14 passengers, and it’s anchored right on the fishing grounds. The Lodge ashore is more of a resort and it’s plush with a few extra amenities if that’s what you like, but it’s at least a 30 minute trip each way from the Lodge docks to the fishing grounds. The crew on the Driftwood were great, the food was excellent (but breakfast is pretty light), and you can fish as long as you like. That fits our style. This year we fished with a guide for the first two days and we weren’t disappointed. Cole was enthusiastic, knowledgeable, and worked hard to get us fish, and I understand the rest of the guides do the same. You’ll pay $400 a day extra for that guide service, but if you haven’t fished downrigger style before, or if you want to save most of your energy to fight the fish, it’s worth it. We opted for a guide because fishing is hard work, and two days on our own was enough individual effort for this trip. Guides are also limited to 11 hours of fishing daily, but you can stay out longer if you are on your own. Boats, fishing gear, bait, and advice are free no matter which way you go. Fish cleaning and freeze packaging is also free unless you opt for individual one-pound-cut portions. You pay extra for that service, but it’s worth it when you get home and find that you don’t have to cut or repackage your fillets. This year we choose a later date for our trip, the first week of September. That didn’t work as well for us because the usual late Coho run didn’t happen this year, and the King salmon bite had slowed down by the end of August. But we still returned home with almost 150 pounds of mixed fillets. I would recommend fishing in this area from late June through mid-August if possible; traditionally it’s a better time of the year for Kings. The fish limits per person this year were the same as last year. There is a daily possession limit of four salmon, two of which can be Kings. The total take limit for salmon is eight fish, four of which can be King salmon. Two fish is the take limit for halibut, but none can be over about 60 pounds and only one fish can be in possession per day. Rockfish limits varied. You can buy your Canadian fishing license and check the limits online before your trip. Last year we filled our cards on King salmon and halibut in late June, but Coho were scarce. Our biggest King last year was 33 pounds. This year we bagged four kings and the largest was 25 pounds. We also limited on halibut, averaging a little over 10 pounds each, and rockfish were plentiful. Pam scored a 15 pound yellow-eye as the biggest rockfish we caught. There were a few Coho around, and we caught some, but they weren’t as plentiful as we expected this late in the year. Maybe they will return again next year? We also lost two nice Kings to sea lions this year for the first time —bummer, but that can happen wherever you go. We always enjoy our Canada trips and this year was no exception. 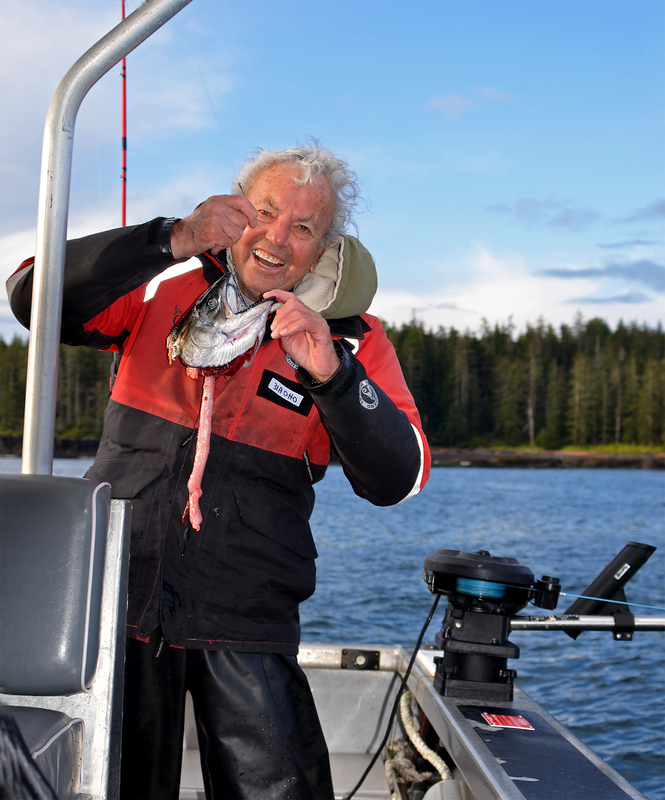 The food at the Queen Charlotte Lodge is excellent whether you are staying on the Driftwood or staying at the Lodge, the staff always treats you very well, and the fishing is good although it varies from year to year and depends a bit on the season. No one can predict the weather, and so far we’ve caught calm seas half of the time, but some wind and rainy days, too. All-in-all, the Queen Charlotte Lodge still runs an excellent operation and we recommend it if it fits your budget. The staff is top notch, and they work hard to keep you happy. The fishing grounds are generally productive and always scenic with plentiful humpbacks and occasional orcas, and bald eagles flying overhead. Try it if you get the chance; we think you won’t be disappointed. 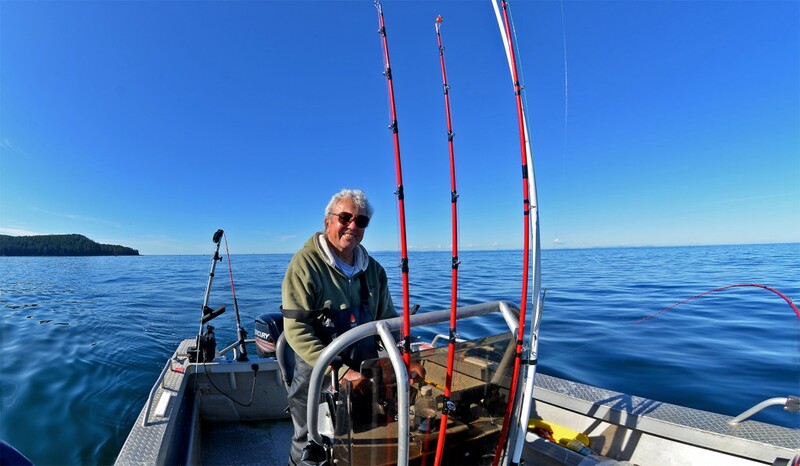 This entry was posted in Canada, Salmon Fishing, Salt Water Fishing, Uncategorized. Bookmark the permalink.